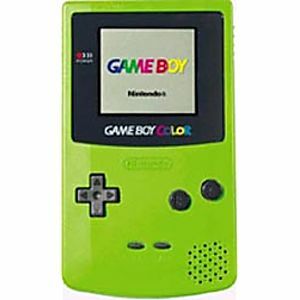 Kiwi Green Game Boy Color System on Sale. 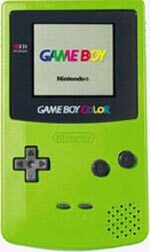 The original Game Boy Color system plays all of your favorite Game Boy games as well as Game Boy Color games. I ordered this for a Christmas gift for my son. It was delivered in a timely manner and was in excellent shape. He was super thrilled on Christmas morning. Bought this for my son for his birthday and we have all enjoyed it. Showed up fairly quickly and works great. Very small damages (to be expected for a product its age) highly recommend this product and Lukie games. I'm always super wary about buying used electronics/consoles/games, but after reading amazing reviews I took a chance and ordered the Kiwi Game Boy Color. I was not disappointed! The Game Boy looks brand new and came with batteries and protective film over the screen. It works so well and I couldn't be happier with my purchase! It was worth every dollar and I will definitely purchase from Lukie again!! The original system I purchased had bubbles in the screen, and the buttons were unresponsive. Emailed Lukie Games, and without any delay they responded to my inquiry, offered me a full refund or a replacement. I opted for replacement, and the new system worked like a charm. I am fully satisfied. I'm very happy with my purchase. The system works great and both of the games I bought work and save as well. Came in the amount of time it specified great deal on the free shipping, had a new screen in great condition plays all games well feels like the 90's all over again. it works as much as you need it to, which is more than enough. Make sure you play in a well-lit area. The system is fully functional and has a new screen as promised. I would say that it is well overpriced however. But oh well. If you have to buy it online I suggest you buy it from here. You aren't risking anything at Lukie Games. Arrived when they said it would, but to the wrong house(UPS to blame). Luckily I received it and I wasn't disappointed. System was in good condition for the age and worked perfectly. Games were in even better condition, would easily buy again. The title says it all. I am a satisfied customer and I will continue shopping for all my video game needs. Ordered this last week and the condition was jaw dropping! I mean just pristine condition, like something you see opening the box for the first time! Great job Lukie will definitely have a repeat customer.